China does not offer visas on arrival, so you will need to arrange it well in advance. In order to apply for a tourist visa, you will need to provide a letter of invitation from a friend or relative in China, or provide a detailed itinerary from your tour company. This will include confirmed reservations and return flights. The visa can be obtained at the Chinese embassy of your home country. Here is a guide with much more detailed information about obtaining your visa for China. The tourist visa allows you single entry and must be used within three months of the date it is issued. Keep in mind that if you depart the mainland and visit Hong Kong or Macau, you will need a multiple entry visa to get back into mainland China again. Unless you are shopping in a chain store or a boutique where the prices are clearly marked, it is possible to haggle the price down and negotiate a better offer. In fact, the vendor is likely expecting to you do so and the first price he quotes you will be quite high. This is essential knowledge when you are enjoying some of the fascinating and diverse markets that China has to offer. Simply give the vendor a friendly smile and offer a lower price. They will go back and forth with you for a while until you meet somewhere in the middle at a price that makes you both happy. If the price doesn’t get down to a reasonable level, you can always say no thank you and walk away. Sometimes when you start to walk away, the vendor suddenly changes their mind and is happy to offer it to you at a lower price. 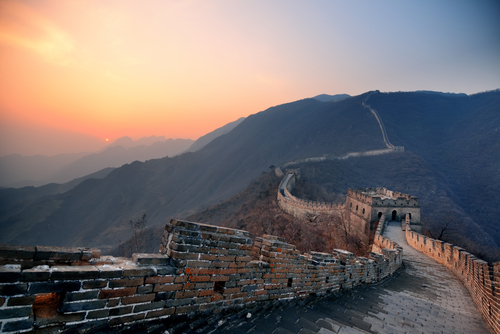 You’ve probably heard of the Great Wall of China, but did you know about the Great Firewall of China? Due to internet restrictions, you’ll quickly notice that a lot of your favourite social media apps and websites are blocked – including Facebook, Instagram and Gmail. However, it is possible to outsmart this block and stay connected. All you need is an international SIM card. If you are using a foreign SIM card while you are in China, you will be able to bypass the firewall completely and use the internet like you would if you were located in the country that issued the SIM card. TravelSim is a smart option for this, as it will save you up to 95% on roaming charges and it provides you with free incoming SMS worldwide. You save even more on data bundles. China is a crowded country with a lot of people, so it’s common for strangers to be pressed closely together in the streets or on public transit. The locals are used to having a lot less personal space than we do in the west and they are not bothered about being squeezed into a crowded subway car or bus. Organised lines don’t always exist and if you want to order food or purchase something you will often need to just work your way into the mix and get the attention of the seller. If someone pushes past you or jostles you when you are queuing don’t be too annoyed or take it personally. Simply understand that it is part of Chinese culture. Did you know that you will need to show your passport when checking into your accommodation, as well as whenever you buy train and bus tickets in China? Also, sometimes you will need to show it when you are exchanging currency or using a foreign credit card at a department store. Due to this, you may want to invest in a good passport cover to protect it and have a secure pocket within your bag so that you can carry around this valuable document. These are just a few of the most important things you should know before visiting this beautiful and fascinating country.